Bower Cottage bed and breakfast is a Grade 2 listed country cottage in a picturesque hamlet; Whitle Fold is on the north edge of the Peak District near New Mills, with views over Kinder Scout, Kinder Downfall, Ollerset Moor, and the hills of the Goyt Valley and New Mills Golf course bordering on to their fields; but not far from shops, cafes, banks pubs and restaurants. An ideal location for walkers, runners, cyclists, mountain bikers, horses and riders with an abundance of country lanes, off road tracks, trails and bridleways. 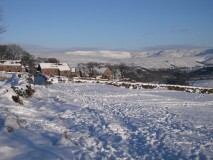 Great for anyone wanting to enjoy outdoor activities in The Peak District, with access to the Pennine Bridleway a short distance away and the Sett Valley Trail leading down toward Hayfield and Kinder Scout.